Delight in our flown-in-daily seafood and innovative cocktails while surrounded by one-of-a-kind décor. With vintage details and original large-scale murals depicting vintage Chicago lakefront scenes, Holy Mackerel! provides a fresh and intimate dining atmosphere. The offerings reflects fresh interpretations of fish house classics. Menus are printed daily to offer only the best and freshest seafood available, including a selection of fresh oysters. Along with fresh fish, Holy Mackerel! features a selection of fresh cocktails made from fruit infusions and other fresh ingredients. Guests of Holy Mackerel! are also able to order from the adjacent Harry Caray's Italian Steakhouse menu. *Menu updated daily. Click here for accessible menus. private dining AT HOLY MACKEREL! Plan your next event for up to 40 guests in Holy Mackerel's elegant Chart Room with its large leather booths, vintage nautical maps and charts and a beautiful mural depicting the Chicago lakefront in the early 1900s. Larger parties of up to 450 guests can be accommodated in the adjacent Harry Caray’s Ballroom. 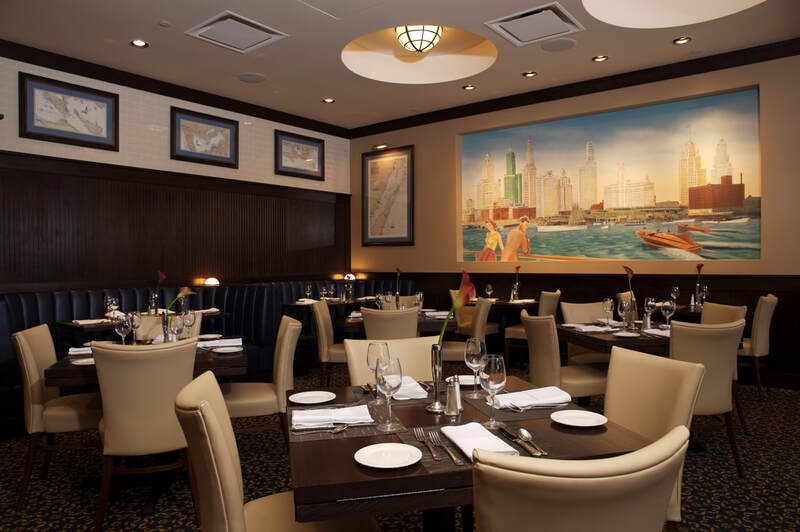 Additionally, Harry Caray's Italian Steakhouse offers additional private dining rooms. Please submit the form below and we will get back to you shortly. For immediate assistance please call 630.953.3400 and ask for Catering. Thank you!